Emory's Stuart A. Rose Manuscript, Archives, and Rare Book Library will host a series of public events in support of “Still Raising Hell: The Art, Activism, and Archives of Camille Billops and James V. Hatch,” an exhibition now on view in the Robert W. Woodruff Library’s Schatten Gallery. Tuesday, Jan. 24, at 6 p.m. Following in the tradition of Camille Billops and James V. Hatch’s New York loft salons, Rose Library is partnering with artist and Emory doctoral student Fahamu Pecou on his interSessions series. Part of an ongoing run of curated conversations between figures from the arts and hip-hop communities, this event will feature hip-hop artist Monie Love and acclaimed dancer and choreographer T. Lang. Thursday, Feb. 23, at 6 p.m.
During this evening of dance and conversation, attendees will have the opportunity to talk with award-winning steppers from Atlanta and around the country. The discussion will be moderated by cultural sociologist, stepper and Emory alumna Anjulet Tucker, who will share insights from her research on the cultural exchange between steppers in Chicago and Atlanta. Saturday, March 25, at 12 p.m.
3+1 is a community film screening and discussion program. Three experts with diverse (and often conflicting) perspectives are featured with one empty seat for a member of the audience to occupy and participate in the dialogue. The series will feature artist and activist Camille Billops’ documentary “Older Women and Love,” which explores intergenerational relationships and celebrates female sexuality. Afterward, event participants representing the arts, women's studies and sexual health will engage “Older Women and Love” within the context of gender, race and relationships. Thursday, Apr. 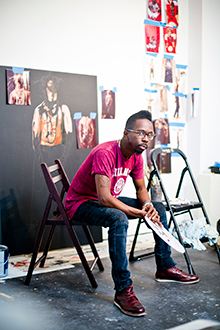 13, at 6:30 p.m.
As the culminating program of the “Still Raising Hell” exhibition, this event will explore the means and mediums through which black artists continue to push boundaries. The evening will consist of a collaborative performance by Jeremy Avalon of WERC Crew and comic book artist and musician Afua Richardson on the future of black art, followed by a discussion with Gallery 72 owner Kevin Sipp that connects contemporary art movements to the exhibition. “Still Raising Hell” remains on view through May 29.